Day 1: Arrive Addis Ababa, welcome eremony and transfer to hotel. O/ n hotel. Day 2: Drive to Arbaminch. O/ n hotel. Day 3: Tour the Nechsar National Park to see the endemic animal sywanes hartebeest, zebra, other animals with abundant bird species and the village of Dorze people. O/ n hotel. Day 4: Drive to Jinka en route visit tribes of konso and Teshmay. O/ n hotel. Day 5; Excursion drive to Mago national park and the tribe of Mursi that are known by Donga (stick) fighting performance. O/ n hotel or camping Mago national park. Day 6: Drive to Turmi via Dimeka to see different tribes altogether if it is market day. O/ n camping/ lodge. 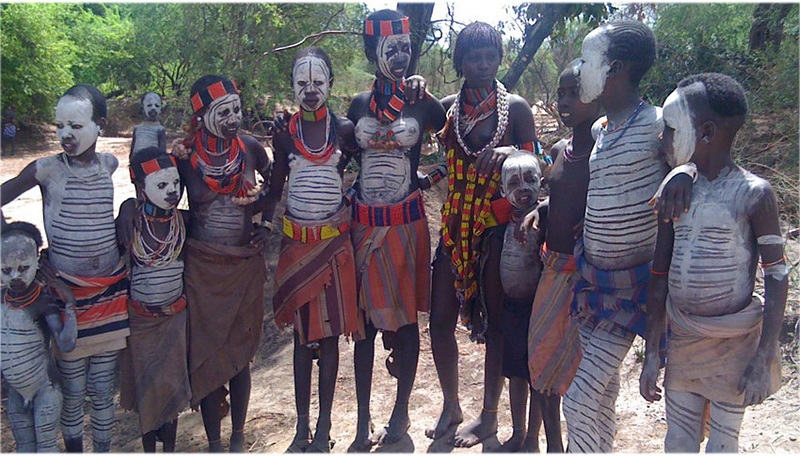 Day 7; Drive to Omorate and cross the Omo River to see the tribe of Dassanech. O/ n camping / lodge. P.M visit the Harmer’s. O/ n camping / lodge. Day 9: Drive to Arbaminch on the way visit the Arbores tribe. O/ n hotel. Day 10: Drive to Addis Ababa via the rift valley Lakes; Night departure. Day 2: Drive Addis to Arbaminch on the way drive through the Grate Rift valley system, lunch will be held at Shashemene, late in the afternoon arrive at Arbaminch. O/ n hotel. Day 3: Drive from Arbaminch to Jinka on the way visit the interesting Konso Village; then proceed to Jinka, lunch will be held at weyito. O/ n hotel. Day 4: Make an excursion form Jinka to Mago National park, visit the Mursi people who live behind the Mago National park and make game drive. Late in the afternoon drive back to Jinka for overnight. O/ n hotel. Day 5: Drive from Jinka to Turmi to visit the Hamer’s people. O/ n lodge. Day 6: Drive to Arbaminch, late in the afternoon arrives at Arbaminch. O/ n hotel. Day 7: Drive from Arbaminch to Addis, then evening departure. Day 2: Drive to Langano on the way visit the crater lakes around Debre Zeyit area, and then proceed to Zeway lake visit the morning fish Market, afternoon visit the Abijata Shalla National Park. O/ n hotel. Day 3: Drive to Arbaminch on the way visit the Alaba Village and the Doreze village at Chencha Mountain, late in the afternoon arrives at Arbaminch.O/ n hotel. Day 5: Drive from Arbaminch to Jinka on the way visit the interesting Konso Village; then proceed to Jinka, lunch will be held at weyito. O/ n hotel. Day 6: Make an excursion form Jinka to Mago National park, visit the Mursi people who live behind the Mago National park and make game drive. Late in the afternoon drive back to Jinka for overnight. O/ n hotel. Day 7: Drive from Jinka to Turmi, on the way visit Dimeka, late in the afternoon arrive at Turmi. O/ n camping/ lodge. Day 8: Make an excursion to Omorate; cross Omo River to the Geleb people, visit their village, back to Turmi for lunch. Afternoon make an excursion to Karo village, visit the Karo people who are famous by their body painting. O/ ncamping/ lodge. Day 9: Morning tour in Turmi visit the Hammer village, afternoon will be free. O/ n camping / lodge. Day 10: Drive from Turmi to Konso on the way visit the Arbores village. Lunch will be held at Weyito, afternoon visit the Konso village. O/ n camping /lodge. Day 11; Drive from Konso to Yabello, visit the singing wall, bush crow bird, chew bet, and the Borena people. O/ n hotel. Day 12: Drive from Yabello to Wondogenet, up arrival at Wondogenet you will encounter wonderful natural forest and natural spa. O/ n hotel. Day 13: Drive to Addis Ababa, lunch will be at Mojo town and then proceed to Addis. Night enjoy at traditional restaurant with folkloristic dances. O/ n hotel. Day 14: Full day city tour the capital; Night Departure. Day 1: Depart for Arbaminch (505km) through the Rift Valley Lakes. O/ n hotel. Day 2: Leave for Jinka enjoying the extraordinary diversity of cultures. O/ n hotel. Day 3: A.M. drive through the natural forests and undulating terrains across the Mago River and visit the Mursi Villages. 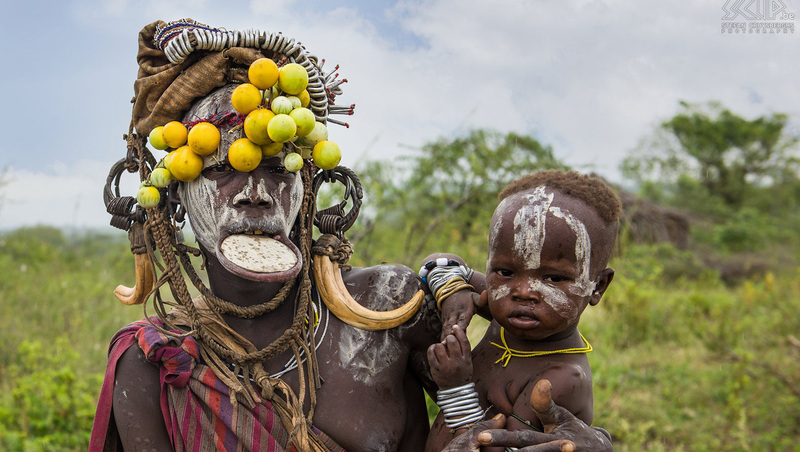 Undeniably, the highlight of your Omo Safari will be the visit of the Mursi women who wear clay lip plates; afternoon game viewing at Mago National Park. O/ n hotel. Day 4; Depart for Murielle home of Karo people who are considered the masters of body painting and decorate their bodies with chalk paint often imitating the spotted plumage of a guinea fowl. O/ n lodge. 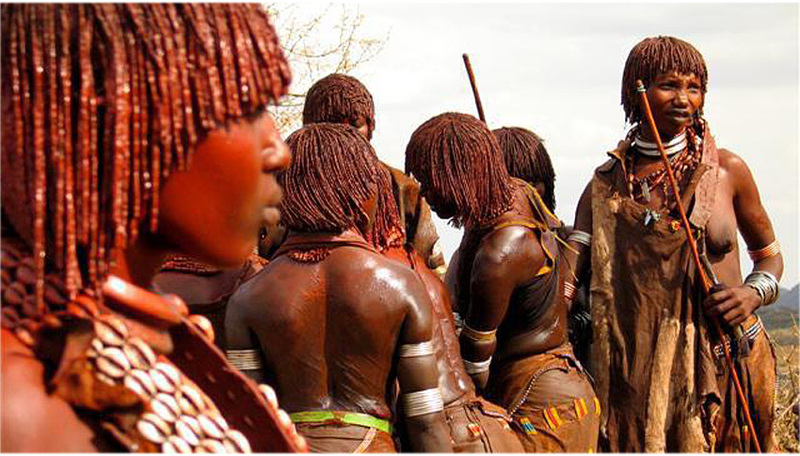 Day 5: Drive to Turmi the capital of the archetypal South Omo residents, the Hammer people that enjoy body decoration like the other Omo area tribes and wear quantities of colorful beads and clay hair buns with Ostrich feathers. O/ n lodge. Day 6: Drive back to Arbaminch visiting more of the tribal peoples. O/ n hotel. Day 7: A.M. visit the village of Dorze tribe’s who are known for their weaving skill and unique bamboo huts; afternoon boat over Lake Chamo. O/ n hotel. Day 8: Drive back to Addis Ababa; Night departure. Day 1: Drive Addis to Awassa on the way drive through the Great Rift valley system, lunch will be held at Langano, late in the afternoon arrive at Awassa. O/ n hotel. Day 2: Drive Awassa to Arbaminch and late in the afternoon arrive at Arbaminch. O/ n hotel. Day 3: Drive from Arbaminch to Konso and visit the interesting Konso Village and surrounding attractions. O/ n lodge. Day 4: Drive from Konso to Turmi via the villages of Erbore and Birllie. O/ n lodge. Day 5: Make an excursion to Omorate; cross Omo River to the village of Omo Geleb people, visit their village, back to Turmi for lunch. O/ ncamping/ lodge. Day 6: A.M drive to Murielle; visit the Karo people that known by body paintings and back to Turmi. O/ n camping / lodge. Day 7: Morning visit the Hammer village, afternoon will be free. O/ n camping / lodge. Day 8: Drive to Jinka; then Mago National park and make game drive. O/ n Camping. Day 9: A.M. drive through the natural forests and undulating terrains across the Mago River and visit the Mursi Villages. Undeniably, the highlight of your Omo Safari will be the visit of the Mursi women who wear clay lip plates and back to Jinka. O/ n hotel. Day 10: Drive back to Arbaminch visiting more of the tribal peoples. O/ n hotel. Day 11: A.M. visit the village of Dorze tribe’s who are known for their weaving skill and unique bamboo huts; afternoon boat over Lake Chamo. O/ n hotel. Day 12: Drive to Addis Ababa and night enjoy at traditional restaurant with folkloristic dances; Departure.